Lindsey Lyman is the founder of Growth Studios, an innovation consultancy that helps companies build profitable new businesses. 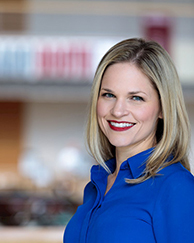 Through her work as a practitioner, Lindsey also helps executives become stronger innovation leaders and helps organizations build innovation capabilities. She consults with leading design firms, consulting firms, large and small companies, and entrepreneurs to identify unique growth opportunities and to build commercially viable new products, services, and business models. Prior to founding Growth Studios, Lindsey spent 10 years at McKinsey & Company, where she helped build McKinsey's global innovation practice and co-developed McKinsey's Innovation Executive Education program. At McKinsey, Lindsey served Global Fortune 100 Asian, European, and North American clients on innovation topics ranging from large-scale innovation transformations, to embedding capabilities in user-centered design and product development. Lindsey currently serves as an External Advisor to McKinsey, focused on Product Development and Innovation. Lindsey has a deep passion for teaching and coaching, which translates to her work both in the classroom and in the field. Lindsey holds an MBA from The University of Chicago Booth School of Business, where she graduated with highest distinction.